KANSAS CITY, Mo. (The Washington Post) — The Kansas City Royals clung this October to the well-founded belief they owned the most dominant bullpen in the major leagues. 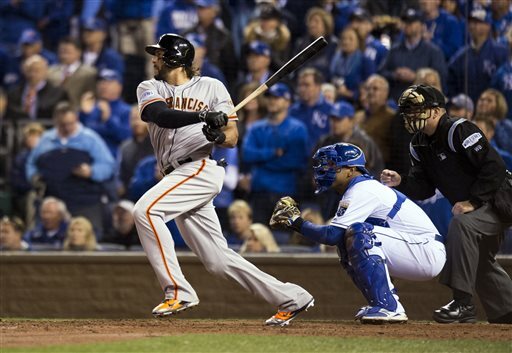 On Wednesday night, Madison Bumgarner emerged from the gates of the left field corner at Kauffman Stadium and informed them of their mistake. The best bullpen in baseball, Bumgarner let them know, with no shortage of menace, dangled from his colossal left shoulder. The best bullpen in baseball was him. Every Royal was a little boy once, and they all dreamed of standing at the plate in Game 7 of the World Series. Childhood fantasies do not include facing a 6-foot-5 force of nature with an invisible cut fastball and malice pulsing through his veins. They do not account for a little boy who grew up in western North Carolina and became a crusher of dreams. 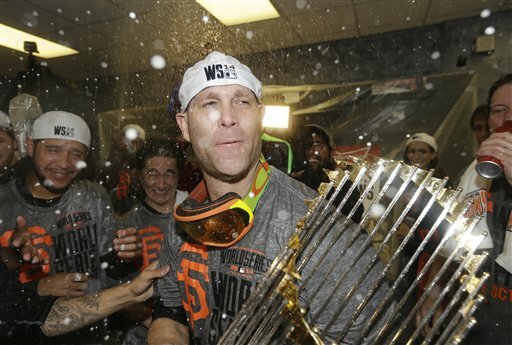 The San Francisco Giants won their third World Series title in five years Wednesday night with a 3-2 victory over the Royals in Game 7. Three days after he fired a 117-pitch shutout in San Francisco in Game 5, Bumgarner took the ball with a one-run lead in the fifth. He held it five scoreless innings, retired 14 consecutive hitters and stranded the tying run on third base after an error behind him in the ninth inning.